If you have a writer in your life, you may struggle to choose a gift that pleases. It doesn’t take long before most writers have an abundance of books or DVDs on the craft, journals for noting character descriptions of passersby, mugs with author quotes (though my Jane Austen mug is a favorite), and writer refrigerator magnets. They will have already subscribed to The Writer Magazine and downloaded Scrivner to the hard drive. So what other writerly gifts would be fun to buy and fun to receive? #5. The Perfect Pen to use at book signings. 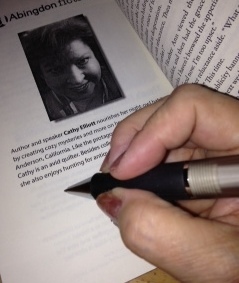 Ready to sign my Author Page for Abingdon’s 2014 Fall Fiction Sampler. They have a cushioned grip so my hand won’t tire after signing dozens and dozens of books. Okay, it hasn’t been a problem yet because I haven’t had that long line of fans spilling out the store and around the corner. But I’m prepared, by golly. The ink doesn’t bleed through the book page or leak all over my hands. #4. Literary Cookie Cutters. Your writer can whip up a batch of cookies featuring the profiles of our dear Jane Austen (I need that cutter to compliment my mug), the Mad Hatter, Harry Potter’s glasses, an open book or bookworm, Clifford the dog, and more. Ideal for any literary event. 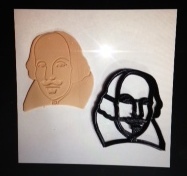 Check out the Bard cookie cutter shown right (William Shakespeare) on Etsy. #3. Seems like we need some tea to go with those cookies, eh? How about some Hobbit Tea (left) for the Tolkien fan in your world? 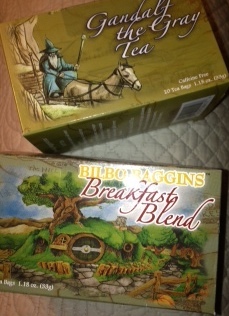 I bought both the Gandalf the Grey Green Tea and Bilbo Baggins Breakfast blend. Rave reviews from two LOTR devotees when they received my gift. Unusual and tasty, too! #2. 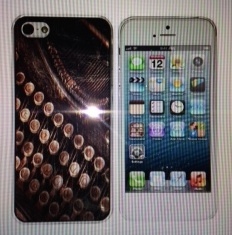 Steampunk Typewriter Phone Cover (right.) I really want this, even though I’ll have to figure out how to pry the present cover off my phone. They seem pretty bonded. But, what a way to remember you are a writer every time you use the phone. And remind your friends. And a drum roll, please…..
#1. Typewriter Key Jewelry!! Oh, yeah. Best gift ever! If you like Steampunk, if you like vintage, and if your gift target is a writer, you’ll like this. Each piece is handcrafted using authentic, vintage typewriter and cash register keys from 1900-1940s. The keys are recycled from non-working typewriters, only. I recently bought a fabulous bracelet from The Magic Closet with designs by Gail Selby. Mine spells out WRITER using various colored keys and silver-plate backings. Check out the picture below. Looks right at home on my computer. Great weight to it, nicely crafted. 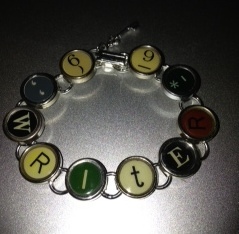 In the bracelet category, there others that spell out EDITOR, I * WRITE, AUTHOR, and more. Each is unique; no two are alike. Worried about your sales numbers? Teaching your baby to count? Forgot the date of your wedding anniversary? Gail has number bracelets that will do the job. (And she can do custom orders.) There are earrings as well, and handsome cuff links for the fellas in your writer sphere. Don’t mean to give a one-woman sales pitch for The Magic Closet. Or…maybe I do? I’ve seen Gail Selby’s work and am ordering again. Today! However, there are other artisians on eBay or Etsy who have different designs you might enjoy. Take a look. Just type “Typewriter Key Jewelry” in the subject line and start shopping! This is a gem, Cathy! I love all five of your suggestions. I use pens that were gifts from people that believe in me too. Such a loving way to encourage a writer. The cookie cutter and tea ideas do compliment each other and I see a Jane Austin Tea in your future. The phone cover case is a clever venture too. But I have to say, the typewriter key jewelry is my favorite. I collect vintage typewriters, And I know a quaint gift shop at Lake Tahoe that sells them! Thank you for the unique and creative writer/author gift ideas! You are very welcome, Kathy. Isn’t that typewriter jewelry amazing? Now, I have a C initial necklace coming. 🙂 And BTW, did you notice the picture inside the book I was “signing” is one you took at Lake Tahoe? Thanks so much! Where do you find that Hobbit Tea? I happen to know someone who would love it!